A bold front-running performance from Dancing Rain and jockey Johnny Murtagh resulted in a three-quarter length victory in the Investec Oaks. Winning trainer William Haggas, who won the Investec Derby 15 years ago with his first (and still only) runner in the race, had not previously had a runner in the Investec Oaks. "This is what it’s all about," said a hoarse Haggas. "It’s just a matter of getting the right horse and on this occasion the right jockey. She’s a big long-striding filly and we got lucky because we were left alone in front. Johnny was able to pop her back to sleep for a bit and bide his time. But he said that when the other filly (Wonders Of Wonder) came to her she went again and wanted to win. "Last year she was hopeless but she steadily getting better and she’s still getting better. Johnny was clever but she stays and we didn’t make enough use of her last time. That’s the learning process and she has done it well today. "My wife Maureen has always ridden this filly at home but unfortunately they had an accident going out of the stalls three weeks ago and Maureen broke her leg. The filly has rewarded her, anyway." Jockey Johnny Murtagh added: "I was hoping she would be able to make the jump going up to a mile and a half today and it worked. William said he’d be happy for her to go on as she stays well and we got lucky that we didn’t have to do too much in front. "It was straightforward. I said to William that there was no pace in the race and I think that I will make the running. I watched the videos and she seems to travel very well and she is very uncomplicated. "William rang me a couple of weeks ago to see if I could ride but I didn’t know if I’d be needed by John Oxx at the Curragh and it was only last Tuesday that I knew I could ride. "She set a nice pace but she was ducking and diving forever so I knew that there was loads left in the tank. I thought that if we got to the six-furlong pole, she could maintain a good gallop down the last six (furlongs) and it would take something to pick her up in the last half-mile. "It worked really well for her and she is a lovely big, powerful filly. I think that she broke Maureen’s leg with a kick but I am sure that she is forgiven now! "I knew that Group Ones were going to be hard to come by this year but you get a name as being a go-to man and thankfully I got it and William rang me up for the ride. You need to be in these big races and you need to be on the animals to come out on top - thankfully, I was on a good one today." Maureen Haggas added: "It was just one of those silly accidents - it wasn’t her fault - it was one of those silly things but unfortunately I broke my fibula. Having ridden her all winter, I haven’t been able to ride her for four weeks, which has been extremely frustrating. "Rosie, one of the girls in the yard, has ridden her and she has done a brilliant job. It has been a big team effort. "I thought that she would stay and I thought that she would come round here because she is beautifully balanced. She got beaten at Newbury unfortunately - she probably should have won - but I thought that she would improve for the trip. "I looked such an open race. In a normal year, on what she had done, you probably wouldn’t have run but, because it looked so open and I thought that she would come round here, I thought that we might as well have a go and everyone seemed to agree." Aidan O’Brien had no complaints after Wonder Of Wonders came off second best to Dancing Rain in the Investec Oaks. Kieren Fallon chased the front-running winner on the Cheshire Oaks heroine but the pair never looked like fully bridging the gap. Wonder Of Wonders, sent off the 3/1 second favourite, was three-quarters of a length adrift in second, with O’Brien’s Misty For Me finishing fifth and stablemates Why and Eirnin running down the field. O’Brien said of the runner-up: "I am delighted and she has ran a stormer. "I suppose we could have done with a better pace but it was the same for all of them and she has ran a great race. "I think the downhill run unbalanced Misty For Me a bit." Jockey Frankie Dettori was handed a 10-day ban in the Investec Oaks for failing to ride out for third place aboard the 9/4 favourite Blue Bunting. The suspension takes place from Friday, June 17, to Sunday, June 26. Kieren Fallon, who finished second on Wonder Of Wonders, said: "She just lost her action half way down the straight which didn’t help her chances." 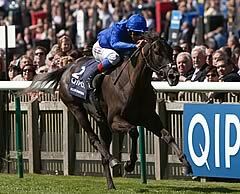 William Buick, who rode the third-placed Izzi Top, commented: "I was very happy with her. She stays a mile and a half well. It was a slow pace and she might not be as good as the first two but she is still very good." Frankie Dettori, who rode fourth home and 9/4 favourite Blue Bunting, said: "There was no pace and the track didn’t suit her." Seamie Heffernan, fifth on Misty For Me, said: "My filly ran a good race and we had a good position but the track might have been against her. It is the first time she has come down such a big hill. She has pulled up sound so will be ready to fight again." Fran Berry, seventh on Siren’s Song, said: "It was a slowly run race and my filly can be keen so I had to drop her in to give her a chance. It turned into a sprint and my filly got a bit unbalanced, but came home well in the last furlong and a half. She is definitely worth another shot in this company." Joseph O’Brien, at 18 the youngest rider in the race, was eighth on Eirnin. He said: "They went very, very slow, but my filly ran a nice race." Sam Hitchcott, ninth on Zain Al Boldan, said: "Johnny has had his own way from the front and dictated the race. Half way round Tattenham Corner I thought we might be in trouble but you have to hold her up to switch her off and she did that well. There are no excuses." Ryan Moore , 10th on Havant, remarked: "Johnny rode a very good race and had things all his own way. My filly just didn’t like the ground."